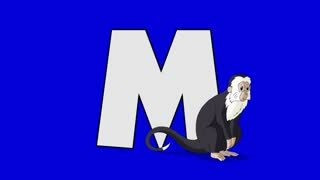 Search Results for "animated monkey"
Letter M and Monkey (foreground)	Animated animal alphabet. Motion graphic with chroma key. Animal in a foreground of a letter. 1960s: Shadow of bicycle. Car drives behind cyclist. Boy in monkey costume turns in front of car. Animated starbursts. Paper bag with text. Children in monkey costumes ride bikes and run down street. 1960s: Boy in monkey mask. Man looks back from open car window. Car pulls out from curb and hits cyclist. Boy in monkey mask covers face. Animated starbursts. Paper bag with printed name. 1960s: Girl in mask rides bike down street. Truck drives down road. Girl in monkey costume rides bike through stop sign. Girl in mask looks around. Truck slams on brakes. Girl in mask covers face. Animated starbursts. 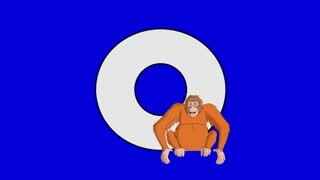 Letter O and Orangutan (foreground)	Animated animal alphabet. Motion graphic with chroma key. Animal in a foreground of a letter. Primate animated word cloud, text design animation. Kinetic typography. 2d Animation motion graphics showing drawing sketch style illustration of a chimpanzee walking viewed from the side set on white screen and green screen with alpha matte done in 4k ultra-high-definition. 2d Animation motion graphics showing drawing sketch style illustration of the Gelasian and early Calabrian stages of the Pleistocene period viewed from the side set on white screen and green screen with alpha matte done in 4k ultra-high-definition. Funny Cartoon Gorilla Climbing on Skyscraper Building. 4K Pixel Art Retro Game Style Animation. A giant electric sign is switched on and a worker climbs it, in Chicago, Illinois, in 1935.